Why Do We Love Nulon Engine Oil? Nulon have leapt head first into the hyper-competitive world of racing engine oil, as you’ll discover in this Nulon oil guide. The launch of this Nulon engine oil – Nulon Racing – came as a highly-anticipated announcement for their many loyal customers, following years of Nulon supporting numerous World Time Attack events, race teams, and, of course, the Nulon Nationals events. Nulon Racing is the passion-project of their technical manager, Ian Johnston, who toured the globe to study some of the world’s most prestigious full synthetic oil manufacturers to help develop the Nulon engine oil racing range. Nulon pride themselves on sharing the passions of each of their car-loving customers – whether their taste is classic or modern; sports car or muscle car; 4WD or a tradie’s ute. Their full synthetic oil range for race/performance is no exception to this mantra, with the creators determined to push boundaries and make the best Nulon engine oil for track, street, and high-performance lovers. Why is Nulon Racing Oil So Awesome? Nulon Racing Oil is such an impressive full synthetic oil that you’d think it were being made exclusively for the world’s most elite race teams. Nulon racing starts with Group IV Poly Alpha Olefin (PAO) and Group V Alkylated Naphthalene (AN) base oil stocks. While most high-end companies, such as Motul with their 300V range, use Ester for their base stocks, Nulon claim that their formulation offers more stress resistance, greater kindness to your engine’s seals, and a boost in engine-additive performance. These base oils in the race Nulon engine oils are then enhanced with an anti-wear, anti-corrosion additive package that’s optimised for extreme use in race and highly-modified street engines – it’s the perfect Nulon oil for your race, track, sports, and high-performance vehicles! 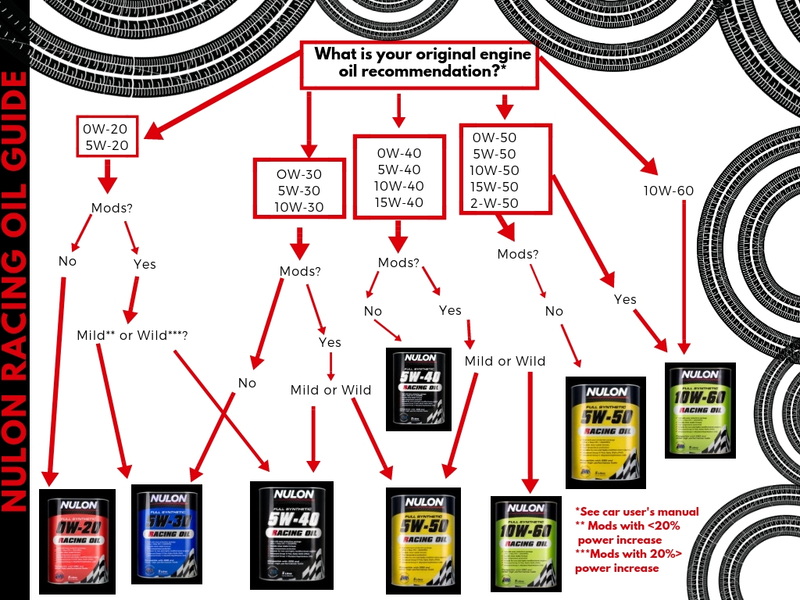 Which Nulon Racing Oil Should I Buy? Your Nulon Oil Guide! The Nulon Oil range for racing is not to be overlooked by any motorsport enthusiast. Built from the ground up to be a certified world leader, these Nulon engine oils are a timely offering from a company that has already made its mark on Aussie roads and stands proudly as an Australian motoring institution. It’s a welcome racing oil addition in an industry where sourcing full synthetic oil for race application is often costly and over-exclusive. Get your hands on your perfect Nulon Racing Oil at Sparesbox!